Please stop by our booth at the FSEA meeting! Khemia Software will be exhibiting at the FSEA’s Spring Meeting and Technical Session on May 10th – May 12th. For additional information, please see www.fsea.net. Full-time position for an established IT professional to support and improve its Best-In-Class software product marketed as Omega LIMS (Laboratory Information Management System). This product is used by commercial and government laboratories to handle all phases of lab operations such as sample management, scheduling, analytical results, QA/QC, reporting and invoicing among others. This position entails design, development, testing and implementation of new features and functionalities as well as fixing issues reported by clients. The physical location of this job is in Livonia, Michigan and cannot work remotely. Khemia Software is a premier provider of Laboratory Information Management Systems (LIMS) for the environmental, water/wastewater, food & beverage, manufacturing and chemical industries. Founded in 1995, the company has successfully implemented its LIMS in numerous laboratories across the United States and internationally. Our professionals have extensive experience working within laboratories and understand the challenges that clients face. Combining this background with over 20 years of product development has culminated in Omega 11, our most feature-rich and configurable LIMS to date. 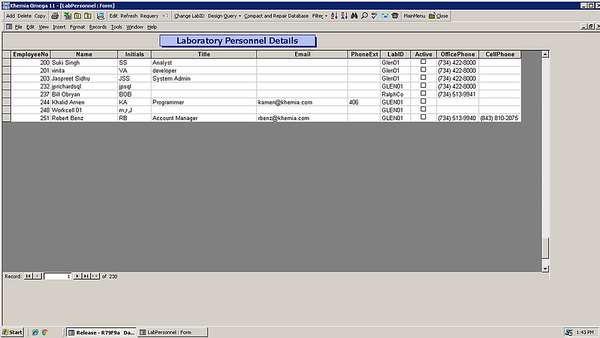 In addition, database roles may be set to allow staff access to different sections of the LIMS. For example, analysts typically do not have EDD administration rights and often do not need to mind the pricing of analyses to clients, however, many laboratories find it useful for their analyst to see vendor pricing and have access to linked files. Similarly, office staffs that have little to do with the actual validation of data can have this restricted from their roles. HR is often best utilized when first applied before an accidental overstep occurs. In addition to training records, OSHA record keeping requirements for injury and illness, etc. may also be met simply by recording the vital information within the LIMS and linking/attaching the proper files. This information is important for employers, employees and OSHA in evaluating the safety of a workplace, understanding industry hazards and implementing worker protections to reduce and eliminate hazards. 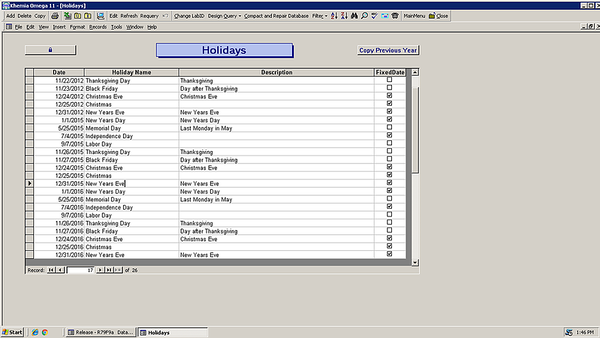 On a lighter and simpler note, holiday schedules for laboratories are also extremely important. 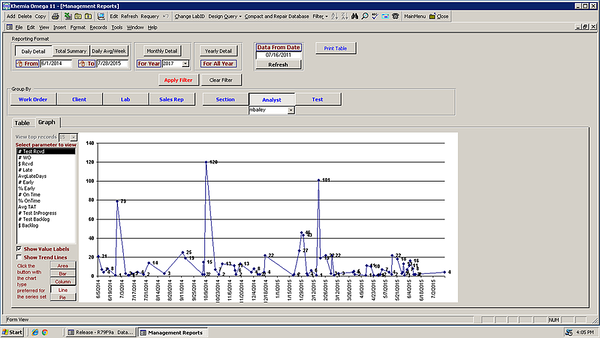 Laboratories routinely have to schedule short-hold time analyses and sampling events. Many laboratories have to run around the clock with multiple shifts all year long. Simply by making a record of the holidays upfront and apparent, as seen below, and by properly scheduling people to be in place can avoid much heartache and confusion. I do remember some improperly scheduled events ruining my social plans as an analyst as well as ruining a number of employees’ plans as a department manager. Most definitely a case of “a little planning goes a long way” towards employee happiness. Another major advantage within a LIMS for HR is employee evaluation. Obviously an employee’s worth is not wholly tied to production, but it does certainly play a hand. As many laboratory managers can vouch for, pulling old log books and seeing how many analyses and batches an employee ran is often a matter of making a good guess with some backing. 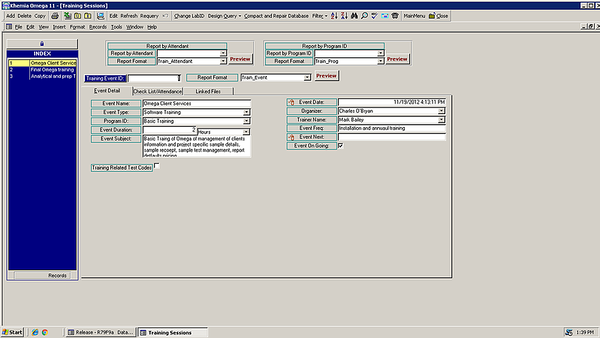 Within a LIMS, this can be done with a handful of keystrokes to give a true performance evaluation as all data going into and linked to the LIMS is linked to the employee via their log in credentials. Key performance metrics by department and by analyst may be pulled under a wide variety of time scales and other criteria from this management dashboard. Often, from a management perspective, departments can be looked at based on total work completed, work completed late and work by an individual analyst to best judge what or what might not need to happen within a certain group. Again, often with a little HR pre-intervention, HR issues can be laid to rest before they become realities that a laboratory has to deal with. While HR in any organization is not necessarily straightforward, it does have some unique challenges in the laboratory world. By simply using tools that already exist in a mature LIMS, HR’s grasp on the needs and needed controls may be largely gained without going well outside the box. For any additional information, please contact Robert Benz (rbenz@khemia.com) at Khemia Software, Inc. (www.khemia.com). This article may also be seen at on LIMSFinder (www.limsfinder.com) at http://www.limsfinder.com/BlogDetail.aspx?id=42315_0_2_0_C. More details on this course can be found at the TNI Educational Delivery System home page at: http://nelac-institute.org/content/load_eds.php?id=98.